Many promises were made in the lead up to the highly consequential 2016 vote on Prop 64 in California to legalize the cultivation, processing, manufacturing, distribution, testing, and retail sale of adult use cannabis in the 5th largest economy in the world. The truth is, as sloppy as the rollout of the new regulations have been, the bill was deeply flawed from the start and many grassroots cannabis advocates and activists voted no on 64, aware of the pitfalls that it would present on the supply side of the cannabis curve. Some of those who voted in favor of the bill failed to research it properly, simply thinking it would mean legal weed would finally be available in their own hometown. But one of the tightest nooses around the neck of Prop64/AUMA (Adult Use of Marijuana Act) is how much power it has given to local cities and counties in the permitting process of new cannabis related businesses. The state has been able to issue temporary licenses to thousands of growers, extractors, distributors, and retailers, but the vast majority of those temps are being delayed their annual licensure status based on their local authorities taking one last stand against legal weed. This has created immense “pot deserts” where consumers must drive over an hour to find a legal dispensary. Likewise, it leads to growers, manufacturers, and other essential pieces of the supply chain traveling far from home to conduct their business legally. But even those numbers are few, as the permitting bottleneck at the lowest levels of government continues to cripple California’s regulated cannabis market. Since the passage of Prop 64, thankfully over 100 supplementary bills have been filed in attempts to patch the ship which appears to be sinking before it even leaves the harbor. One such bill, introduced at the end of February of this year by Democratic State Assembly Member Phil Ting, is aimed squarely at the stranglehold currently choking what is supposed to be the largest cannabis economy on the planet. AB 1356 is a clever piece of legislation that, if passed, would require any Cali jurisdiction that had at least 50% of its electorate vote for Prop 64 to allow a minimum number of license approvals for commercial adult use and medicinal cannabis operations within that jurisdiction. The bill would require the minimum number of those local licenses required to be issued in that jurisdiction to be 25% of the number of currently active on-sale general licenses for alcoholic beverage sales in that jurisdiction, as specified, unless the minimum number would result in a ratio greater than one local license for retail cannabis commercial activity for every 10,000 residents of the local jurisdiction, in which case the bill would require the minimum number to be determined by dividing the number of residents in the local jurisdiction by 10,000 and rounding down to the nearest whole number. That’s more math than we want to do on a Monday morning but suffice to say, we just love the provision that the same lawmakers who approved X number of liquor stores within spitting distance of schools, parks, churches, and DMVs would now have to count them all up and divide by four and start writing cannabis license approvals right away. Watch these doofuses start shutting down liquor stores to avoid the big bad pot shops. 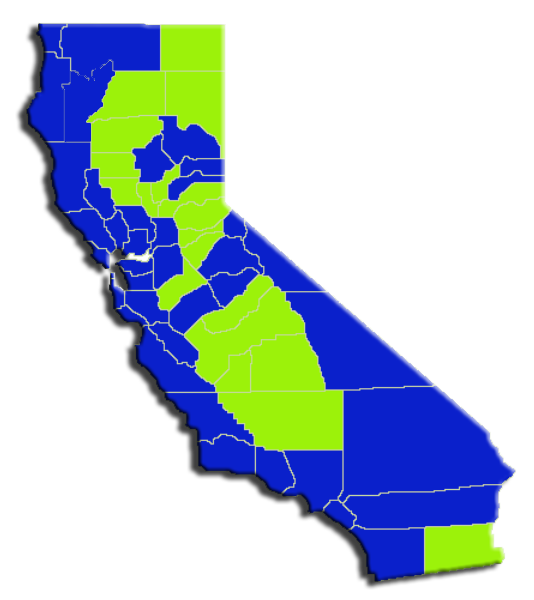 According to the California NORML, 39 of the state’s 58 counties had a majority vote for Prop 64. Of the 19 that did not meet that 50%+ threshold, many were very, very close. But this new piece of legislation specifically makes 50%+ the target, so what areas would that include? Well, believe it or not, the Emerald Triangle collectively voted in favor of Prop 64 – Humboldt County 59%, Lake County 58%, and Mendocino County 54%. Even Trinity County eked it out at 50.4% (a difference of just six votes). San Fran topped the list with 74.3% in favor of AUMA, followed by Marin and Santa Cruz Counties at 70% each. As with pretty much all cannabis legislation, AB 1356 is not perfect. The bit about counting liquor stores is cathartic, but it weakens that stab in the same paragraph by essentially saying that there should still only be 1 license granted for every 10,000 residents. It is exactly this sort of extreme limitation that has the legal market hamstrung and has state lawmakers scratching their heads wondering where their precious tax revenue is at. We also find it interesting that when push comes to shove on the “treat cannabis like alcohol” debate, cannabis gets 1/4th the rights of alcohol. The bill also only mentions mandating retail dispensary licenses. What about cultivation, processing, manufacturing, or distribution? As far as we can tell, AB 1356 will do little to help the earlier stages of the supply chain and will just assume that product somehow magically appears on store shelves. According to MJBizDaily, of the 482 municipalities in the state, 390 of them do not allow cannabis dispensaries six more have not allowed or disallowed any. Now written into the state constitution, AUMA requires a 2/3rds vote in both houses of the state legislature on any proposed amendment deemed to “further the intent and purpose” of the law. There is no one universal jigsaw piece of legislation that will cure California’s cannabis crisis, but this looks like it could be an interesting part of the puzzle.